As part of NaNoWriMo, some snippets from my characters' lives as they have played out the past 6 months since I started SWToR. Can You Really Come Home? The echo of her footfalls echoed in the corridor as Jaakra made her way back toward the speeder landing pad. This had been the first time in over five years she had set foot in Imperial Intelligence HQ. She had come under the pretense of a job and had gotten far more than she’d bargained; far more. Read more about Can You Really Come Home? Solar Winds whipped the sand up off the planet’s surface. In another few hours, all would be calm again. In the distance, the hum and whine of gears and machinery churned from the droid factory. Here within the carved in enclave of a home was the House of Galin, a sith family sent to represent the Empire’s interests with Genosia. Lord Fa’lin Rhecor was the patriarch of the respective house, with his wife, Thi’leyre at his side. Recently the Ascendency has confirmed the existance of small private organization funded by the Imperial hierarchy previously unkown to our society. We believe that our considerable resources and specially trained forces may be of assiatance to this organization. The treaty of Cisilla has placed certain requirements upon the Ascendency in exchange for the Imperials support. One of those requirements placed upon us is to provide professional and expert personale within the Empire and as we have no currently established representitive within this society we have sought as always to improve our service to the Empire. Bounty Hunters are known for many things and just as many names, but the one title that strikes fear more than any other is "Jedi Killers". Many a hunter pride themselves for their ability to fight against even defeat Jedi, but one such gun for hire takes it to a higher level. Torkas Sheridan has a growing reknown for being the prime example of a "Jedi Killer". Always taking the iconic Lightsaber hilt from each kill, the vast number she has already accquired would make a Sith bow in respect ( Though never happens). Jedi Masters, Council Leaders, Battlemasters, Sages, Guardians, even lowly apprentices have fallen to the feet of this unflinching Warrior. The living embodiment of ancient Amazons, Torkas takes almost a sick pleasure in killing those with the Force. Her outright hatred for all Jedi came from a single devistaing event when she was a mere child. Ti’arial sat back in her chair, switching off the holoviewer, pausing for a moment in reflection. Flipping back her hood, the confines of the Fury class Starship suddenly seemed claustrophobic to her. It was rare that she had moment where her thoughts relapsed back to her time in a collar. But lately, she was finding it harder and harder to integrate into free society. It was however, the gravelly voice of the Dashade on board that brought her out of her memories. he focused on being himself, reminding himself which was show and which was real. with off, but were dim enough to that he could see outlines of the room. Read more about Unfortunate truth. My work out here on Alderaan is yeilding wonderous discoveries and results I can not wait to share these with you and will do so soon. In the mean time I understand that you have in your employee a wonderous linguist and researcher Lady Eimear. I would so love to have her assigned under me on this project. I believe her wealth of knowledge would speed the discoveries we are finding as well as grant her the chance of a life time to experience this wonderous setting. I hope you find it in yourself to see the worth of this endevour and grant me this request, I know you will not be disapointed in the results. Should you agree, please have Lady Eimear report to House Thul, I will arrange for her accomidations and transport out to the various sites. The soft click of a hatch opening nearby, brought the apprentice into wakefulness. The grinding of metal as clamps met with hull sounding loudly on the shuttle's frame. The grey eyes of the rattataki had already begun to change. Unlike most who left the Sith academy, the former slave had found a true calling in the use of healing with the force. That very talent was tied to compassion, so if she wished to serve the Empire, she had to remain meek, and docile in mind and action. Ti'arial's tie to the force, had little influence from the dark side. That influence was simply because she had lived under Imperial control her whole life, and knew, loyalty was rewarded. If she had chosen to defect, she was wise enough to know she would have been killed quickly since her talents rested in the mending of body and mind. Shandi Vitaan stood at the front of the elevator, waiting patiently as she hummed to herself. She heard footsteps coming up from behind her. Shandi paid no attention to them, why would she?, being on the Imperial Fleet gives a person no reason to be paranoid. The Imperial Officer coughed, "Shandi Vitaan?" Shandi spoke without looking back, she corrected him with a degrading tone, it was amplified in tone and harshness with her breather. "Do not know who you are talking to? My name's 'Predi'." He became agigated. "I am Lieutenant Jol Thek. 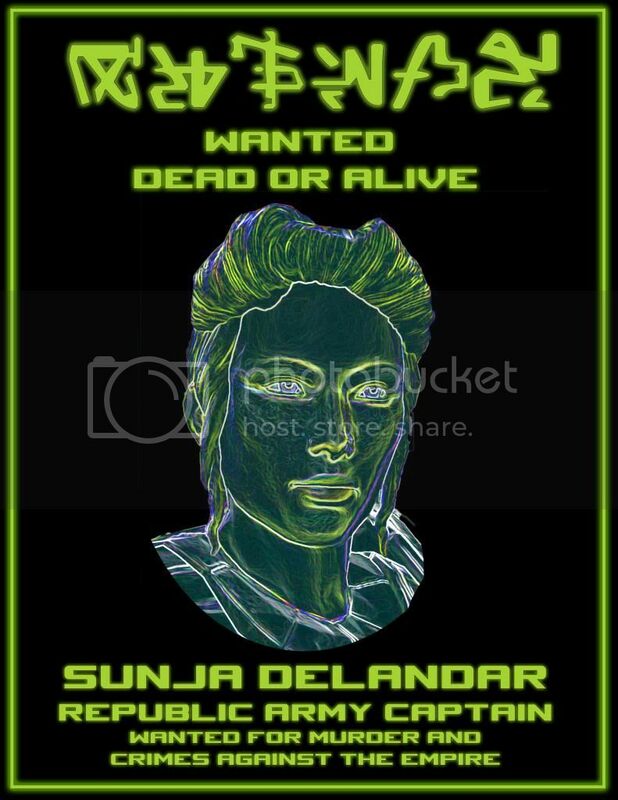 You are hearby under arrest, Sergeant Shandi Vitaan". Recorded message sent to Ateya, Touren and Trixie about The ITC chanel leaking to the Imperials. "Howdy! Henerkin here. y'all might wanna change the company's holo frequency, cause it has a leak. Recently, when Rafy got taken by the Imps, they could log into that frequency. As for Rafy, they said they would trade her for the admiral I have in carbonite. I accepted the deal. They should contact me soon. I'll keep radio silence from now on until its patched and I'll have Camoni looking up into that leak. And if it ain't a leak, its a rat, and if it's a rat, we`ll be much obliged to settle the score. Read more about Recorded message sent to Ateya, Touren and Trixie about The ITC chanel leaking to the Imperials. A tattered piece of parchment is nailed to the door of the Invicta Trade Company... nailed by the claw of a Skirtt. I've met a few of you on my adventures into the Human lands. Strange lot... but amusing none the less. While traversing the plains, it dawned on me the many dangers that lurk about. Ones where someone of less knowledge of the hunt could easily be taken off gaurd. Though my instincts are to hunt alone, I find an internal vibe to help those in need. Maybe the Spirits of my ancestors are guiding me to this. As such, I offer my services to the lowly souls who seek to explore the lands of Tyria. My might brings fear to my foes, and my blade has split many a challengers limbs. Barnardine, the mandolin playing Mando, shares a little story about her meeting with Ostillio. The Crew was held there by the guards for about an hour while the Warden was trying to contact Touren or Ateya. Eventually, he received an answer on his pad. I am Lady Ateya Julii of Alderaan. CFO of Invicta Trade Co. I can assure you, that both these men, and all members of their crew, are protected by authorised letters of mark and reprisal, issued by the senate, and ministry of commerce. I was informed by my daughter that you have a large shipping company, able to move vast amounts of cargo safely across the lands of Tyria. I would like to propose an offer to you. One that I hope both of us will prosper from with astounding riches. As my daughter told you, I am the Baron to a large diamond mining facility within Kytra. My predicament is finding a versatile methods of exporting my goods to the other various regions. I believe you could be the solution to this problem. The tales of my daughters adventures and endeavours with such a fine gentelman have proven your worthiness to fufill such a noble deed as this. Lady Erikah would like to cordially invite you to an evening party near the shores of Lion's Arch for an evening of gallivanting on Saturday, the 6th of October at 8:00 pm EST. The event will be held near the shoreline. Casual attire is encouraged. Synthesis sat in her small office bent over her desk, a datapad in her hand. Although she stared at the device her vision was elsewhere, replaying the evenings events. The night had started off well enough, she had called her new Apprentice Jay to meet her on Alderaan where she explained to him that together they were going to retrieve an ancient artifact that she had learned had fallen into the hands of an ignorant Lord. The 'attack' on the stronghold had a secondary purpose though, Synthesis planned on taking this time to evaluate her new apprentice and gauge his abilities and loyalty. The Skull and the Crossbones were in the Belsavis orbit with their crew planning their stay. They took a job to go inside the prison and help fixing a gang problem. The Blood of Talath, the most violent Rattataki gang, were at it again with explosives and were threatening the wilderness outposts. They had to find who among the Rattataki was building the bombs and get rid of him, a simple bounty hunting jog for the most part. Simple until Camoni found out who it was. The target was called Nades inside the walls, he was an explosive expert and one of the most respected Blood of Talath member. He also happened to be a native of Belsavis, meaning that he was there because of his ancestors and technically, did not commit any crime against the Republic to get there. That made Henerkin smile with that killer smile he usually has when he is up to something. The thought hovered just outside conscious thought.